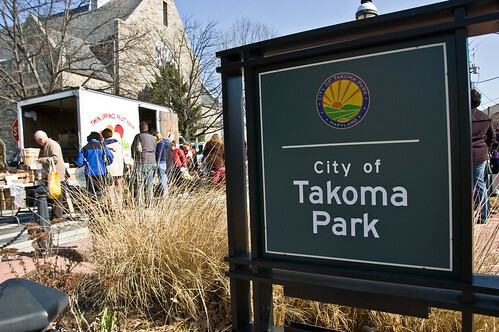 Even though they area under separate laws and governed by different municipalities, Takoma and Takoma Park share a common identity. The area is known for its social activism; residents successfully joined together to oppose the North Central Freeway Project in 1964, and they had a great impact on the Takoma Metrorail station (which sits on the Washington DC side, thus the name). Initial plans called for high-density commercial and residential development around the station and a 500-space commuter parking lot, but residents organized a group called Plan Takoma that developed the alternative of what you see today: a public park, a 100-space parking lot, and the retention of medium-density houses and shops. If you’ve never been up that way, you should take a day to check it out: there’s a cute historic main street, a fantastic recreation center with a great pool, and a very cool cohousing project. 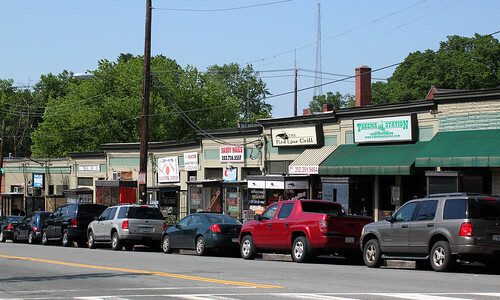 So, now you know– Takoma and Takoma Park are two different places, in two different jurisdictions, that share a common boundary and community identity. The Takoma (DC) Metro station is not in Takoma Park, Maryland. And for goodness sake, it is not spelled Tacoma– that happens to be a city in Washington (the state, not the city). It’s not so simple as you describe. For instance, the Washington DC branch library on 4th Street NW is the Takoma Park branch and you do occasionally hear the not-incorrect usage, Takoma Park, DC. they used to both be part of a suburb called Takoma Park, until the District of Columbia grew up to its current boundary. No, the DC boundary hasn’t changed since the 18th century. Much of the District was suburban for most of its life, yes, but the boundary has always been there.